Last week, I harvested my mugwort. I was humming when I started, but soon I began to sing. I continued singing until I was finished. Yesterday when I walked to the raised bed the mugwort shares with comfrey, meadowsweet, black cohosh, and lady’s mantle, the mugwort told me it was time to harvest. I felt holy as I harvested. Ancient. Doing what witches and other wise women have been doing for all time. I have only been growing mugwort for a few years. I planted it when I decided I wanted Druid herbs in my medicinal herb garden. I didn’t want to eat them or medicate myself with them: I wanted to be in their presence. Mugwort was one of the plants that called to me when I visited Mostly Medicinals in Portland, a local herb grower. The proprietor warned me that mugwort could take over and I should be careful with it. I took her admonition to heart. Every year I’ve cut the mugwort before it has gone to seed. Including this year. Before I harvested the mugwort, I regularly went out and hugged them. And when the neighbor children came over and we walked around my yard, the little girl hugged the mugwort without any prompting from me. When I meditated, sitting next to the mugwort, wise women emerged to share laughter and secrets with me. I always feel as though I’m near power when I am close to the mugwort. I feel as though I am with my elders and I had better pay close attention. Mugwort is a common European plant that was called the mother of all plants for some time. It was one of the plants in the nine-herb charm of the Anglo-Saxons. It’s genus is Artemisia (think Artemis), and it’s been used all over the world as medicine and food. Pharmacologically mugwort is an aromatic bitter (helps digestion and nutrition), and many herbalists considered it the go-to herb for all kinds of women’s complaints. The moxa used in Chinese medicine is mugwort. Matthew Wood says that constitutionally, highly intelligent, gifted, and artistic people benefit the most from mugwort. In times past (maybe still?) people apparently put it in their shoes or carried it around their waist when traveling to relieve fatigue and to protect them from wild beasts and evil spirits. It was also considered a power plant and was used by shamans and other healers alike to smudge and clear people and places. And regular folk have been using it in dream pillows to help incubate dreams for a long while. 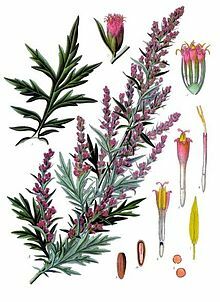 I read in several sources that mugwort was considered a fairy herb, particularly because of its ability to relieve fatigue (tiredness is often associated with fairy mischief). I was surprised to learn that mugwort was also associated with mermaids. In fact, some sources said mermaids actually gave mugwort to humans. I tried to track down the origin of this particular association. It may have started with a Scottish folktale about a mermaid who called out to the villagers when she learned a young girl was dying. She insisted they give the girl mugwort. The villagers did as the mermaid instructed, and the girl survived. That was about all I could find. Beyond that, I’m not sure why—in folklore terms—mugwort and mermaids are associated. Perhaps it is because mugwort is considered a “female herb” or maybe it is because mugwort has been used to help people dream; after all, the dream world is a kind of oceanic realm. In Church of the Old Mermaids, Myla has her first encounter with the Old Mermaids via a dream. It must go deeper (or differently) than that, but I haven’t found anything else that explains this link between mugwort and mermaids, and I haven’t had any lightbulb moments of insight about it. Perhaps after reading this you’ll have some dreamy ideas on why mermaids supposedly gave mugwort to land-loving humans. Let me know if you do. In the meantime, I’ll put some mugwort under my pillow. Perhaps I’ll dream an answer.